Does everyone like the simple things, can it be learnt? I spent all friday filming a ‘thingy’ you’ll see soon about top tips to save money. I’ve actually found myself more contented and less stressed having had to cut back since the big hairy northern one was made redundant, so it’s got a very positive spin on it. Then we had the lovely weather at the weekend. I love the smell of spring. I love lying on grass and being barefoot. I love counting daisies with the kids. I love picnics. I love walking the dog in the evening when it’s around the time that the sun comes down and everything starts to smell different. So I’m a big fan of ‘the simple things in life’. For many of us I think that the recession is forcing us back to a time where we can appreciate these ‘simple things’. I’m not being flippant about the fact that there are also extremely difficult times at the moment, but for most of us who still have food to eat and roofs over our heads it’s not the worst thing that could happen. I was brought up to climb trees, lie on my back and watch the clouds, and imagine fairies in the bushes around me. What of the children with different interests who grew up to love stuff, clothes, gadgets or expensive things? Is it more difficult for them? The media is full of examples where kids are sent to somewhere to get back in touch with nature; like ‘Living with the Amish’ or years ago there was a bootcamp thingy for troubled teens. Those teens eventually seemed to reconnect with nature and come home more complete and contented. So maybe it’s possible for us all? Perhaps it’s about finding our version of ‘the simple things in life’? The big hairy northern one would love nothing better than a huge rucksack and unattractive fleece on his back whilst trudging up some cold and dreary mountain. I admit that this doesn’t work for me as I’m more of a chill out and make daisy chains kind of girl. Thank god the idea of ‘glamping’ is now beginning to filter down into just making camping more homey. What do you think? Is the potential to find contentment in ‘the simple things’ inside of us all? Or are some people too far gone? 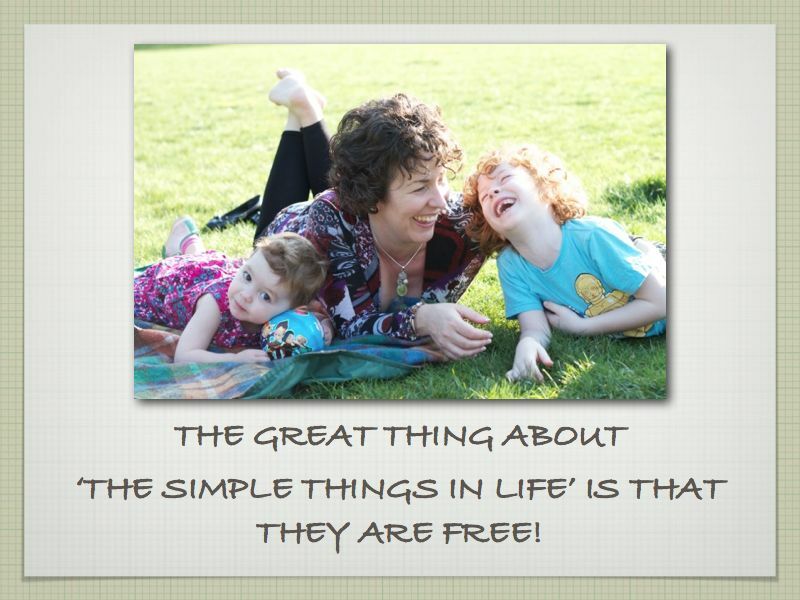 What are the ‘simple things’ that you love that cost hardly anything? Or is the idea of cutting back horrific to you? If you have to give up more and more of your little luxuries as this recession continues to hang around, is it causing you more stress or setting you free? Do we take too much for granted and think that expensive things are necessary when they aren’t really? Adventure, Redundancy, Tips For Saving Money advantages to the recession, benefits to the recession, is having less money better for us, is spending less better for us, money saving expert, money saving tips, recession, reconnecting to nature, the simple things in life, what are luxuries, what are necessities? Does your past affect your worries about your children’s schooling? Love this post! I hate the consumer/ materialistic society we live in. It really is all about the simple things for me & Jess; baking together, digging in the garden/allotment, going to the beach for the day, picnics, making mud pies in the garden, watching tadpoles turn into frogs, playing dens. So glad I grew up this way. Some people definitely are too far gone though, I know if thirteen year olds who get their hair highlighted, nails done etc all at great expense and the simpler things in life have little meaning to them. Nothing much saddens me more than the thought of Jessica finding no pleasure in these things and preferring a days shopping. I do like having pretty things but definitely know where to draw the line and favour buying second hand / fair trade etc. Being frugal can be great fun, it should be taught in schools!